Article Templates are reusable pieces of content, including text, tables, images, videos, or any other preformatted snippets you create. You can use article templates to add a disclaimer, custom formatting block, notice, warning, preformatted text, recurring paragraph, boilerplate text etc. for quick insertion to your articles. 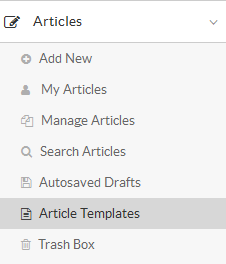 Expand the " Articles " section in the left navigation bar and click on " Article Templates " link. By default, " Manage Templates " page will open. You can click on " Add Template " tab to create a new template. In multi-language editions , the template is added to the language selected in language drop-down. The selected language name and icon is displayed on the screen such as English is displayed with 'Template Details' in the above screenshot.
" Title " is the heading of the template. Multiple templates with the same title are not allowed in the knowledge base.
" Content " inscribe the body of the template. PHPKB provides WYSIWYG editor with various features just like we see in MS-Word to edit the content of a template. You can mark the template as active in " Template Options ". If active , a template will be visible in inserting template dialog for insertion into the article. Click the " Preview " button to preview the template before saving. Click the " Save " button to save the template or you can click on the " Cancel " button to abort the process.